SpeakApps, now in its dissemination phase, was one of the projects featured in the strand “European projects supporting TC”. The SpeakApps tools and tasks, originally developed for use in distance and blended language learning, are also suitable for use in telecollaboration. 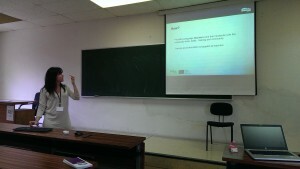 “There continues to be substantial interest in SpeakApps, so our new project can really help us meet the demand for the tasks and tools”, explains Sake Jager, who is one of the partners of SpeakApps and, at the same time, a member of the INTENT research group, which organized and hosted the conference in León. During the conference, we invited people from different universities all over the world to pilot the platform, to test the tools and to add their content to our OER database of language learning tasks. We made many new contacts for future (tele)collaborations. Stay tuned! You can follow the twitters during the plenary session @SpeakApps.